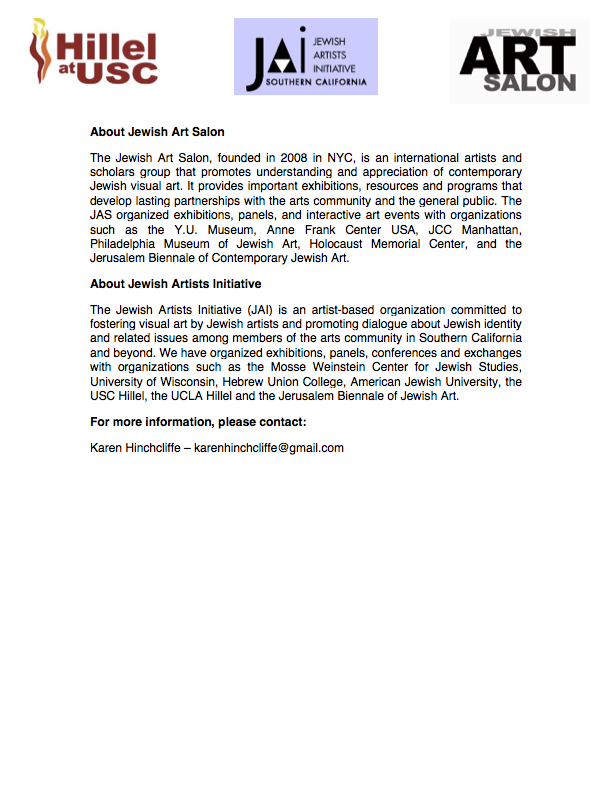 The Jewish Art Salon partners with the Jewish Artists Initiative to present two High Holiday-themed exhibitions. 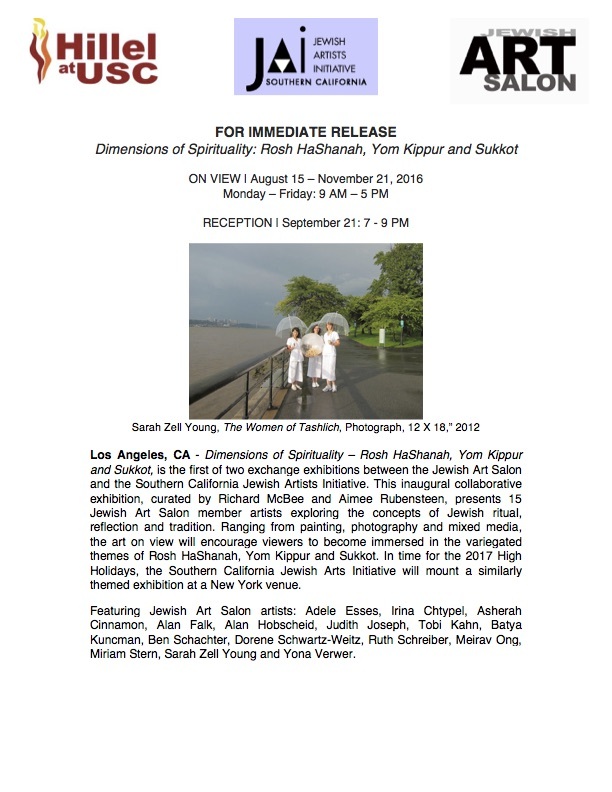 Dimensions of Spirituality – Rosh HaShanah, Yom Kippur and Sukkot, is the first of two exchange exhibitions between the Jewish Art Salon and the Southern California Jewish Artists Initiative. This inaugural collaborative exhibition, curated by Richard McBee and Aimee Rubensteen, presents 15 Jewish Art Salon member artists exploring the concepts of Jewish ritual, reflection and tradition. Ranging from painting, photography and mixed media, the art on view will encourage viewers to become immersed in the variegated themes of Rosh HaShanah, Yom Kippur and Sukkot. In time for the 2017 High Holidays, the Southern California Jewish Arts Initiative will mount a similarly themed exhibition at a New York venue. Featuring Jewish Art Salon artists: Adele Esses, Irina Chtypel, Asherah Cinnamon, Alan Falk, Alan Hobscheid, Judith Joseph, Tobi Kahn, Batya Kuncman, Ben Schachter, Dorene Schwartz-Weitz, Ruth Schreiber, Meirav Ong, Miriam Stern, Sarah Zell Young and Yona Verwer. Within the burnt edges of the image, hues of red, orange and brown splatter the surface. This Jewish man, in the center of the composition, is deep in prayer; he appears untouched by the chaos around him. The artist describes the subject wearing Teffilin as a “Jewish soul in the modern world.” He stands in stark contrast to the realm of the High Holidays wherein the ‘signs’ of tefillin, are not needed to remind us of our closeness to God. Yom Kippur is a Day of Atonement on the Jewish calendar. It is a time of reflection and repentance. Soul Accounting, with its detail, represents the way in which the artist describes “an internal audit of our sins and measure them again our positive actions.” The artist utilizes a wood block for her print – a technique using a relief pattern so the areas that are “white” are carved away with a sharp tool, leaving images to show in “black” – and is appropriate considering the duality embedded in the images she represents, such as birth/death, white/black and light/dark. Ong utilizes unconventional materials, like gunpowder, to explore and combine the dichotomies between the physical and the spiritual, the soul and the body, the light and the dark. These dichotomies are painfully apparent to all of us during the High Holidays. In Closer and Negative Space, controlled chaos ensues. The image emerges only when the opposing materials interact and overlap on the surface. Rosh Hashanah is the Jewish New Year, complete with traditions and rituals. Creation of Heat is a visual celebration of God’s work. It represents the very beginning of the world with some of the original elements, such as fire and water, and of course, creativity itself. The artist explores Tashlich and its connection to the process of atonement and creativity. Tashlich is a Hebrew word meaning “to cast off.” It is a practice, which symbolizes discarding sins by throwing pieces of bread into a flowing body of water on the Jewish New Year. Sarah Zell Young explains that this ritual is both individual and communal. The three women pictured are holding a large plastic ball filled with pieces of bread, and their gaze confronts the viewer to join their act of repentance. This photograph, shot from below the hands of three women holding a plastic ball filled with pieces of bread, is part of a larger series, exploring how the ritual of Tashlich combines both a highly personal and communal experience. Casting away crumbs of bread, representing personal sins, upon the water is an act of atonement. We Share the Weight highlights our shared transgressions as each overlapping hand literally carries the weight of the transparent sphere. Each year on Rosh Hashanah we start anew. Tobi Kahn’s glimmering acrylic painting represents what appears to be a path or road. The asymmetrical composition gives just enough information to the viewer to begin to engage with the yin yang imagery, and begin their route into the New Year. Instead of the usual male guests, Yona Verwer’s sukkah guests are biblical women. Miriam is associated with water: Miriam’s well, and leading women in celebration after crossing the Red Sea. This painting, it’s shape and size approximating a tambourine, or the view looking down a round well, shows an abstract water image, penetrated by Miriam’s prophetess light. This striking view from the Women’s Balcony on the High Holidays reveals two women, still anonymously seen from the back while one child bravely waves to a male relative far below. The artist tells us that in the Syrian Jewish community when the Torah is brought out of the aron on Shabbat and holidays, the women cluster around the mechitza to catch a glimpse and blow kisses, expresses the feeling that the Torah is “rohi”; i.e. my spirit…my soul! Alan Falk’s terrifying image, “The Azazel,” recasts the Yom Kippur scapegoat as an evil beast cruelly caught in the barbed wire of hate. Falk sees the historical Jewish struggle with unfounded bigotry and prejudice, here in the red thread tied to its horns – a reference to the Yom Kippur expiation of the sins of the Jewish people – instead symbolizing the sins of the accusers. While “After the sailors heaved Jonah overboard…the sea stopped raging” (Jonah:1:15) the terror had just begun for Jonah. He scrunches his face in disgust, half swallowed by the fish, half drowned by the sea. This image is just the beginning of the punishment of the prophet who refused to obey God’s order to prophesize to the city of Nineveh. This evidences the theme of Teshuvah, incorporating the intention and material from an earlier public art installation made just before Rosh Hashanah 2006. I have saved the red ribbons, many with original knots still in them, some still attached to branches expressing the concept of forgiveness and mending/turning around relationships at the High Holy Days. Visitors were invited to tie a red strip of cloth to a branch structure 40 feet by 30 feet, as a personal commitment to mend a relationship in their life. Hundreds of people participated from all faiths. The Mitzvah, “To Hear the Shofar,” from the Mitzvah Kotel project. Our sense of sound evokes the most visceral reactions. From the first sounds of our heartbeats denoting life to being the last of our senses to leave this world as we depart, it is our deepest connection to our inner core. During ovel, the period of mourning for family members, Jews are not allowed to listen to music. Those notes can invoke feelings of which we were unaware, with which we are out of touch. Thus, we are commanded to HEAR the shofar on Rosh Hashana. It is a most powerful tool, capable of reaching our souls and arousing them from their slumber. The sounds of the shofar evoke the most humbling of feelings, from the deepest of sorrow and shame to resolution and awe, from a striving for Tshuva and a yearning to be closer to Hashem to exaltation and ecstasy. A child-like visual equation, Evil on the left, Good on the right, with the simple Jew caught in the middle, seemingly holding them both at bay. Indeed, we all harbor little devils alongside our little angels in our complex and at times confused souls. We hope that on Yom Kippur we can tell them apart. Although I’ve been doing to day card for decades I live only become familiar with this organization recently. I do many mixed media types of art but my career has mostly been involved with fine lettering arts and calligraphy. How do I submit work for this upcoming exhibition? Ted, we love your work, but this exhibit is only for our member artists. The call was publicized in our last newsletter. Some of our exhibits feature guest artists (JOMIX is one of them) but mainly we draw upon our membership. I accidentally sent this without checking the auto correct from dictation. What I meant to say was ‘although I’ve been doing Judaica art as well as secular pieces for decades, i’ve only recently discovered the Jewish art salon. How can I get involved and perhaps exhibit in this upcoming show.? We understood what you meant… You are welcome to join us as a member. Your work is very good. Lokah samastah sukhino bhavantu May ALL beings everywhere be well, happy, and free from suffering.